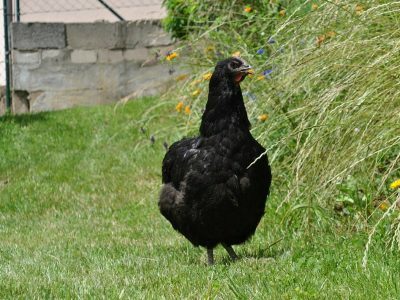 If you are planning on raising chickens for meat, then you are surely looking for the best chicken breeds for meat production. Meat chickens are breeds of chickens that are naturally bigger, heavier, and/or rounder than other types of chickens. They also have been purposely bred over the years to produce the highest amount of meat possible per each bird. So, they are usually large with broad chests and big thighs and tend to look like the football players of all the chicken breeds. These qualities make them the number one choice for those raising chickens for meat specifically. Meat chickens are usually poor egg producers, in comparison to other breeds of chickens. Their bodies are focused on using energy and nutrition for building meat and not so much for producing eggs. Although, there are also a good number of dual-purpose breeds which can be used for meat as well. Dual-purpose chickens mean those that have both a good amount of meat and still also lay a good amount of eggs. They won’t have quite as high of a meat yield as the specific meat chicken breeds but they still produce a decent amount. The type of chicken you choose will probably depend on your purpose. Do you want a good all-around bird for your backyard that will provide your family with eggs but also put meat on your table? 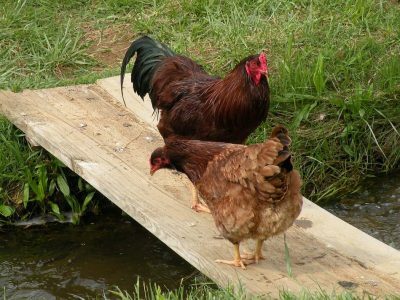 Then you likely would want to choose one of the dual-purpose chicken breeds. But if you’re not really interested in eggs and want to just be raising chickens for meat and are looking for a bird that will give you the highest meat yield, then stick with one of the following specific meat chickens. The first type of meat chicken is not technically a breed, but rather a hybrid cross known as the Cornish Cross or Cornish Rock. It is a cross between breeding the White Cornish chicken with the Plymouth Rock breed. It is the primary type of chicken used by the commercial chicken meat industry today. So, when you go to the grocery store and buy your chicken meat, it is mostly likely a Cornish Cross. They grow fast and have a very broad, well-muscled body with a lot of breast meat. So much so, that if left to grow, they can actually collapse under their own weight because their legs aren’t able to hold them. These birds are usually butchered early between 6 – 10 weeks of age. This is an age where they are large enough for a good meat yield but not yet in danger of collapsing. So if your primary purpose is raising chickens for meat, the Cornish Cross is an excellent choice. However, due to their fast growth and need for a specific diet, they are not a good choice for free-ranging. 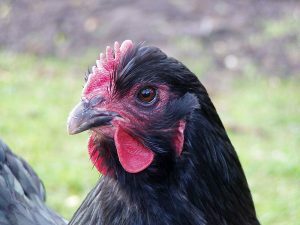 Next of the meat chicken breeds is the Cornish. As mentioned above, it is used for creating the Cornish Rock, but it is also a good meat bird in its own right. The Cornish is a popular choice for those not interested in hybrid crosses. It is known for having good meat quality as well as good flavor. It is another fast-growing breed that has a large broad body and wide set legs. Because it is a natural breed, it won’t have quite as high of a meat yield as the Cornish Cross. But it will still give you a decent amount of meat. It has nice light flesh that dresses easily. Cornish are great for use as broilers or fryers. These are a hybrid variety known as Red Rangers, but can also be called Freedom Rangers or Rainbow Rangers. They were originally developed in France in order to have a good quality meat chicken that would also be good for free ranging or pasture feeding. They do not have the same health and skeletal issues of the Cornish Cross. Yet, they are still wide set, broad, and with big thick legs. Red Rangers do still grow fairly fast but don’t have to be butchered quite as early. They tend to be used in commercial production for organic chicken meat. They will have a somewhat smaller breast size than the Cornish Cross because their meat distribution is more evenly placed throughout the body. The Red Ranger is a great meat bird if you are planning to pasture feed or free range your meat chickens. They will forage for a good amount of their food so will not need as much commercial feed. Due to its naturally large size, the Jersey Giant, a heritage breed, also falls in the class of being one of the good meat chicken breeds. Although technically it is a dual-purpose breed, as it has a decent egg laying capability. 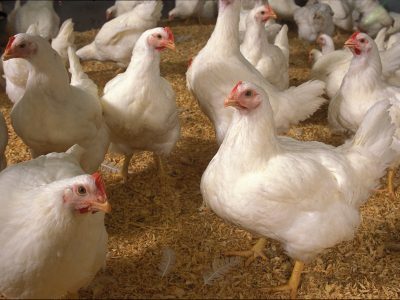 They do excel at meat production as well due to them being one of the largest of all chicken breeds. The Jersey Giant used to be well used in the commercial meat industry, but because of its slower growth, has mainly been replaced by the Cornish Rocks. But if you don’t mind the natural slower growth and are interested in a heritage breed, the Jersey Giant is a great choice for your meat chickens. They also make a good choice for producing large, excellent capons – a castrated rooster known for very tender and flavorful meat. Capon meat does not get as tough as roosters or hens. They tend to be fattier and are considered a delicacy. 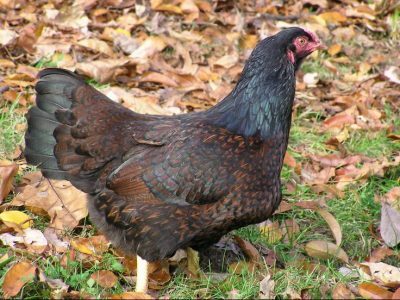 Now if you want good meat chickens but are also wanting to use your chickens for eggs, then other good dual-purpose breeds, aside from the Jersey Giant, would be the Wyandotte, the Orpington, the Brahma, or the Buckeye. Each of these breeds lay a decent amount of eggs and are also great quality meat chickens with good flavor. They may not be as broad and large as some of the specific meat chicken breeds, but they are still well sized enough to produce a nice meaty chicken for your dinner table. If you appreciated this article, please spread the word! Click below to like, share, tweet, or pin it. Thanks for your support!